By all accounts, Dwight D. Eisenhower was a pretty smart guy – one of just a handful of U.S. presidents who made it to the Oval Office without having held any type of elected office. Eisenhower may never have served as a governor or a senator, but he did manage to win a little conflict known as World War II, as the commander of the Allied forces in Europe. Can you imagine a higher-stakes situation in which to prioritize your daily decisions and tasks? Yet he found a way, pioneering what’s known as the Eisenhower Matrix, later popularized in business circles by Stephen Covey. Some tasks are urgent. Some are important. Some are both. The idea is to carefully prioritize so you’re spending as much time as possible on important tasks (obviously the important-urgent ones first), without getting too bogged down in urgent tasks that aren’t important – and especially to stop wasting time on tasks that are neither urgent nor important. This mindset can be as helpful for creating killer content as it is for winning wars. “In every case, not being able to prioritize effectively leads to failure,” says Nicholas Dragon, digital marketing manager at Intermountain Healthcare. When a team can’t set realistic priorities, deadlines are missed, projects are pushed back, clients get unhappy, and teams grow increasingly less effective. You get to the point where you’re putting out fires 90% of the time instead of producing cool stuff. 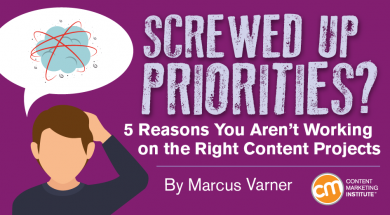 If you’re not feeling as victorious as you’d like to be with your content marketing efforts – or you’re struggling to distinguish whether you’re even working on the right content or not – it could all come down to five simple prioritization problems. Address each of the following in your organization, and you’ll finally be able to lead your team out of urgent land and into unimportant territory, where the cool stuff gets produced. Because he didn’t have a clear window into his team’s complete list of current and upcoming work, it was difficult to calculate the true consequences of agreeing to every last-minute request for help. Office pop-ins aren’t the only way that work requests land in your team’s queue – and that’s the problem. Some projects are initiated through careful planning, arising out of a quarterly planning meeting or an individual kick-off meeting. Others may come by way of email or sticky note, instant messenger, or even a text or voicemail. Still others can be mentioned as an aside in a meeting about something else (“Hey, Lisa, I think we need to jump on Blake’s suggestion. Can your team take that as an action item and make it happen by Q3?”). However you choose to approach it, the goal is to have one place you can go to see what’s on deck for your team – and for all new requests to make their way into that same platform, so you have the ability to weigh them against each other. That whole stopping-by-your-desk thing with a content project that’s due tomorrow, and standing there waiting for you to agree? Yeah, you need to shut that down. How urgent it is. This is a terrible idea, given that sometimes the only reason something is urgent is because the requestor didn’t plan ahead. Ever heard the saying, “Lack of planning on your part doesn’t constitute an emergency on my part”? It’s a good one to memorize. Who asked for it. Yes, you should give greater weight to projects that come from the CEO than the suggestions coming from your summer intern, but you won’t be effective at your job if everyone above you on the org chart gets an automatic yes to every request. After all, what happens when you receive two competing requests from individuals with identical political clout? How do you decide between those? How easy or fun it appears to be. You’ve always wanted to try your hand at creative video content, so when an executive sponsor brings you a fun video project, you might casually wiggle it into the top of your request queue – without really weighing its impact on your other priorities. How well-defined the request is. Request A comes to you outlined in minute detail. You know exactly what the expectations are and how to go about fulfilling them. Request B is vague and ill-defined, but you can see it will have real strategic value. You may be tempted to put Request A at the top of your priority list, partially to reward the conscientious and thorough requester. But Request B might be where the money’s at. This system isn’t really a system at all. It’s the way teams react to requests when they’re in survival mode. Instead, you have to regularly stop and evaluate your workload based on preset criteria, both so you know where you stand and so you have a chance of bringing order to the chaos. Some organizations will use a scorecard or point system to make this process easier. Others prioritize weekly or even daily using the Agile marketing approach. Maybe you are making efforts at prioritizing incoming tasks, but if you’re not keeping company strategy in mind during that process, your list of criteria is nothing more than a cute wall decoration. If, on the other hand, your prioritization criteria can be directly tied to key corporate objectives, they become unassailable – especially when those inevitable interlopers try to get you to bend or break the rules for their pet requests. Chris Savoie, who works at the director level in the software industry, says managers have to think of themselves as translators. You speak one language to those you report to and another language to those you manage. Your job is to translate corporate strategy into actionable work. And when the work is done, you have to translate the results into numbers the bosses care about. “The effort I spend translating my team’s work into reportable metrics helps reveal the numbers I should be paying attention to – and it ensures that the projects coming into my team are aligned with the strategic goals my bosses want,” Chris says. Both during your initial prioritization process and when you’re reporting on completed projects, it’s essential to draw a direct line between your team’s efforts and the company’s foremost strategic initiatives. You may have kept key strategic goals in mind while selecting your prioritization criteria, but if your bosses don’t know that, they’ll be less likely to respect your process. You need to get the royal seal from management. Spell out your process to the top brass, as well as your reasoning. Explain that to stay focused on priorities that will advance the corporate agenda, everybody (including them) must follow your processes as outlined. Nobody gets a free pass to slip a project ahead of the pack. Make it clear that by signing off on your process, they are giving you the authority to say no – or not yet – to anybody (including them). “Bribery. Donuts. Mountain Dew. People try all kinds of things to get around the process,” Nicholas says. He calls the most common attempt the “I’m-telling-dad” routine, where people skip steps in the chain of command to force a team to comply with an unrealistic request. You can have all of the executive buy-in in the world, but if you’re inconsistent about following your own process and enforcing the rules, it will all fall apart, one content project at a time. If you’re finding it hard to diligently follow your own process, consider the possibility that it’s overly complicated. How does a content team determine what is most important, so they’re not constantly being drawn into whatever urgent tasks seem to be on fire at the moment? Start by gaining visibility into your current and upcoming work. Define set criteria for determining the priority of new projects (such as a points system or a scorecard), and make sure those criteria align with corporate objectives. Present your plan to management and get buy-in. Then work within the boundaries you set and let no one skirt the rules. If that all fails, which it won’t, just ask yourself: What would Eisenhower do? Do you want the opportunity to immerse yourself in content marketing training from best-in-class speakers? Make registering for Content Marketing World an important task (and before it becomes an urgent task). Sign up today and use code BLOG100 to save an additional $100 on early-bird rates.